Come out this Friday and Saturday for the final BOB pulls of the season! 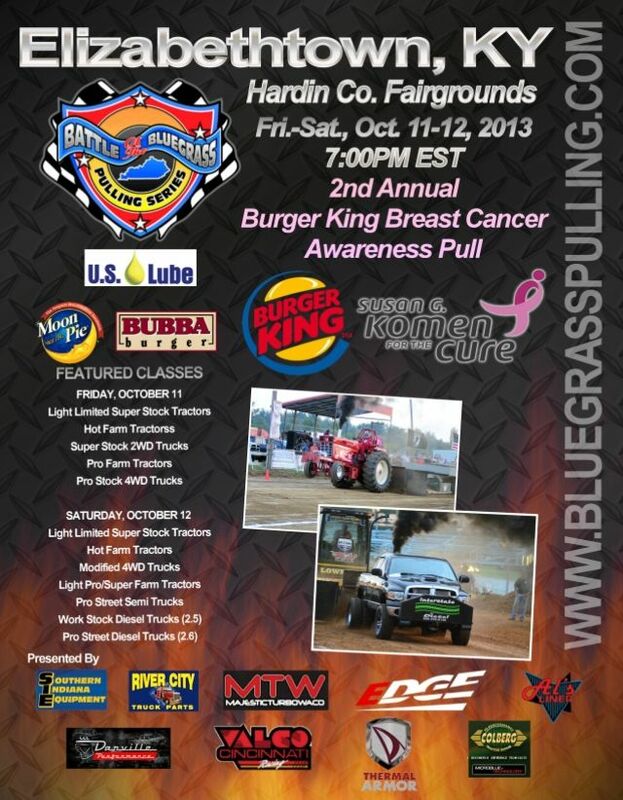 This event is the Burger King Breast Cancer Awareness BOB Championships! Friday will feature Light Limited Super Stock Tractors, Hot Farm Tractors, Super Stock 2WD, Pro Farm, Pro Stock 4WD, and local 2WD. (not pull order). Friday pull starts at 7pm EDT. Saturday will feature Light Limited Super Stock Tractors, Hot Farm Tractors, Mod 4, Lt Pro/Super Farm, Pro Street Semis, Work Stock (2.5), and Pro Street Diesel (2.6). (not pull order) Saturday pull starts at 6pm EDT. Admission is $10. Kids under 6 are free and BREAST CANCER SURVIVORS ARE FREE! The World's Largest MoonPie will be there, as well as kids activities on Saturday, Silent Auction, vendors-- lots there for the whole family! Chris Zollner of Carpe-Imago will be there photographing the pull and is offering a percentage of sales for any photos ordered. He will cut a "check to Tim for 10% of the gross on any print order. The prints can be from any previous BoB event, not just this weekends pull." ATTN Hot Farm and LLSS pullers: Private additional purses have been added to these classes! Art Wooden is presenting $100 to LLSS winner on Saturday. Let's Go Pulling is offering $200 guaranteed money to the winners of the Light Limited Super Stock and Hot Farm classes each night at the Breast Cancer Awareness pull. The number bonuses (10 HF and 20 LLSS) remain the same. This means that the winner of each of these classes can receive up to $300 a night from LGP. Josh Burks is offering $100 and $50 prizes to 1st and 2nd place Hot Farm winners on Saturday contingent on at least 10 in the class. These folks will be presenting their purses directly to the winners during the Winner Circle interviews! For rules, news, and series info, check out our website at bluegrasspulling.com. For updates, pull order, and Winner Circle Pics, like us on Facebook at facebook.com/bluegrasspulling.